888 Poker offers players a First Deposit Bonus of 100% up to $400, however, by downloading 888 Poker here you get an exclusive First Deposit Bonus of 100% up to $600, courtesy of FTR! Once you are transferred to 888’s homepage, just click ‘Download’. Once the installer is downloaded, launch it. 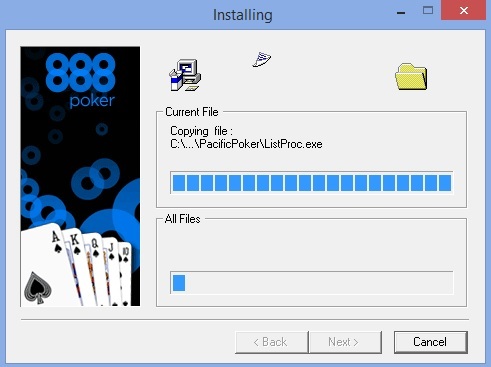 Initially, the installer will download more files for the 888 client, so make sure to allow it full internet access in case you are using a firewall. Once all the files are downloaded, the installer will launch automatically. To begin with, read through the T&C and if you agree with the terms, select ‘Agree’ and click ‘Next’. Choose your installation destination and shortcut settings and click ‘Install’. The installation should take less than a minute to complete. After you have finished installing the client, the next step is to create your new account. 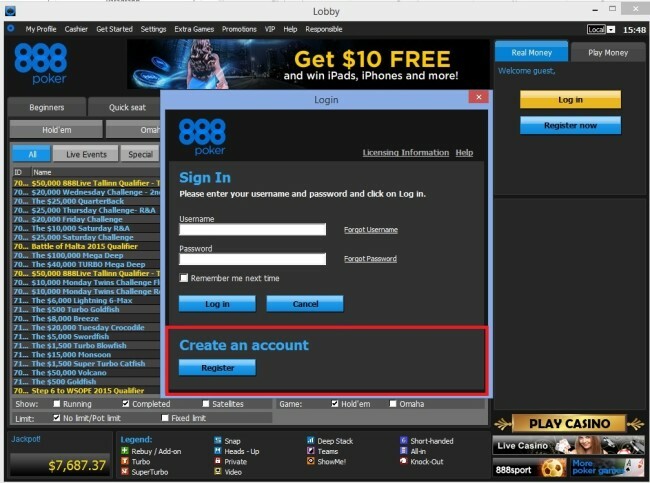 Upon opening the 888 client, you will see a ‘Create an Account’ section at the bottom of the Login window. 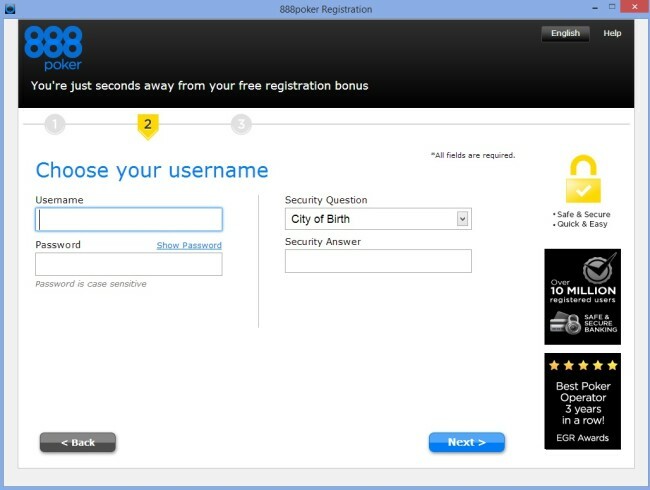 Simply click ‘Register’ to begin the registration process. First, you’ll need to enter your personal information. There is no e-mail verification line, so make sure you enter it correctly. Next, you’ll have to choose your Username, Password and security question. Once that’s done, all that is left is to enter your contact information. All done! Now just go to your e-mail and confirm your registration, after that your account will be activated. On a side note, keep in mind that your account will need to go through another verification process where you will have to confirm your identity and place of residency. 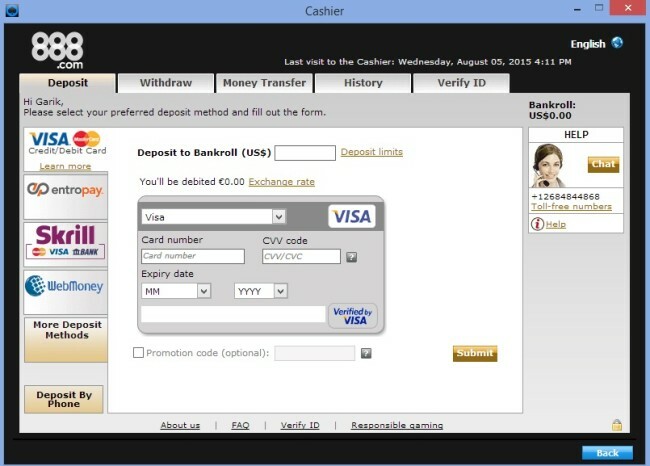 This process usually takes place only when players withdraw money for the first time. To avoid this when withdrawing funds, it’s advisable to just initiate this verification yourself by sending an e-mail to support and asking which specific documents they require to confirm your identity. 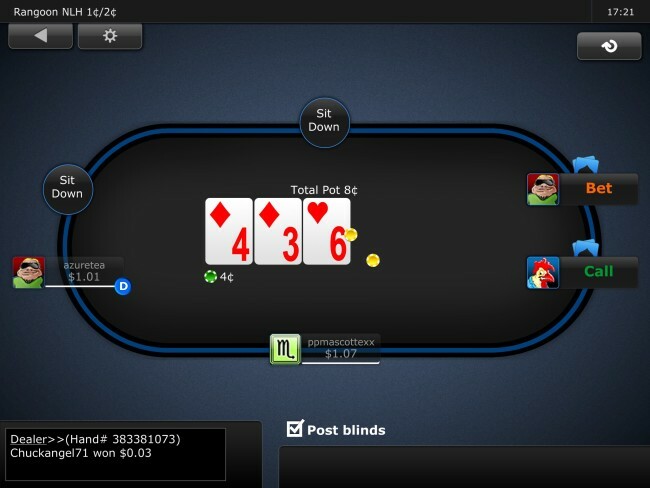 Depositing at 888 Poker is a simple two – step process. First, open the client and navigate to the Cashier. Open the ‘Deposit’ tab. Here you will see the list of all available Deposit Methods on the left side. Select your preferred Deposit Method, fill in all the necessary information and click ‘Deposit’. Most of the available methods like credit cards and e-wallets offer Instant Deposits, though methods like Bank Transfer can take up to a few days to process. VISA cards and trusted e-wallets like Skrill and Neteller are the best option to Deposit, especially since they also facilitate Withdrawals, which is not always the case. 888 Poker’s standard First Deposit Bonus is 100% up to $400, but FTR Members are in luck, since they can get an exclusive 100% up to $600 First Deposit Bonus by downloading the 888 client here. Not only that, but there are also no extra clearing terms, so that’s an extra $200 absolutely free! In fact, the $600 Bonus is not the only thing new players get. Along with the First Deposit Bonus, each new player also receives $88 in additional free cash. Once you have downloaded the 888 client and registered a new account, the $88 Bonus package will be activated. The package consists of $2 in real money and $6 worth of tournament tickets, which will be immediately transferred to your account, while the other $80 will be added as a pending Bonus. The $80 Bonus will be released in $8 increments. A single $8 increment is released after the player earns 20 Status Points. The Bonus will be available for 90 days, so there will be plenty of time to get that full extra $80. 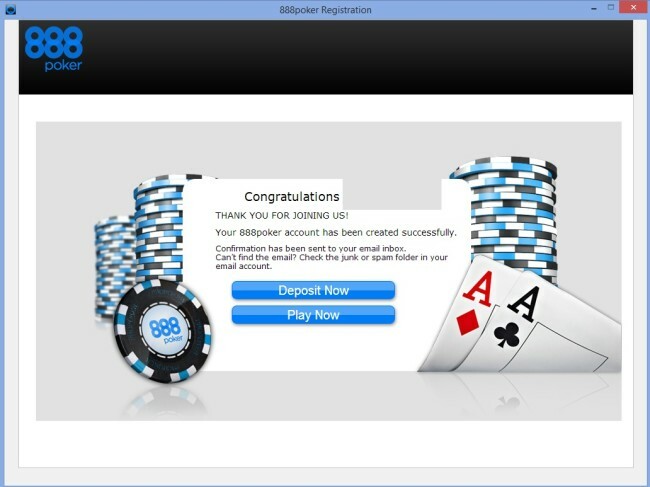 For more details, see our 888 poker bonus review. 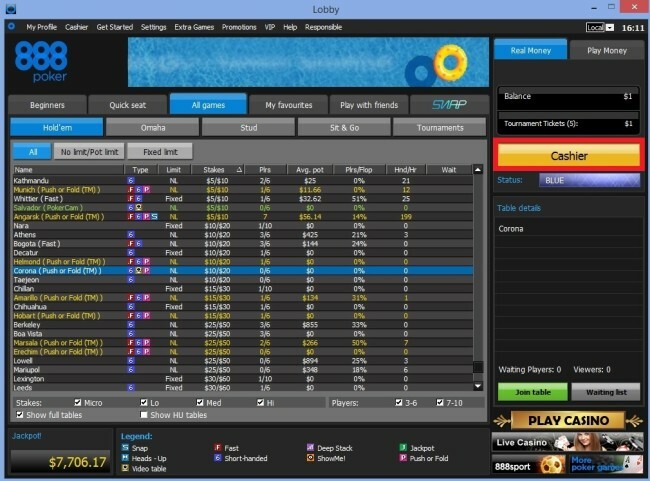 Most new players will find the 888 client’s lobby very easy to use and intuitive. The game tabs are split into the ‘Beginners’ section and the ‘Regular Games’ section. If you are new to the game, try out the beginners section first, where you will only be able to play against other beginning players. However, after a while you will no longer be considered as a beginner, so the beginners section will be closed to you. 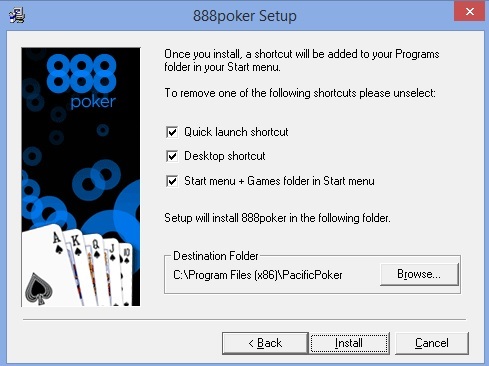 888 Poker has the second highest number of players among all the online poker rooms, so whatever game you want to play, you will likely find it at 888. Cash Game and Tournament traffic are the most abundant with games running regularly all the way to high stakes. Sit & Go traffic is not that great, but peak hours usually bring action to those games as well. The 888 client is compatible with both Windows and iOS systems and users using different operating systems can use the client too by running virtual windows machines on their PC’s. 888 uses the industry standard RSA security keys, which allow for safe data transfer and a 0% chance of anyone accessing your personal information. 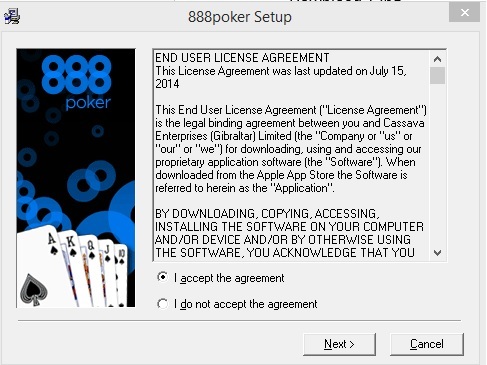 Up to date there have been no security issues with 888 Poker. 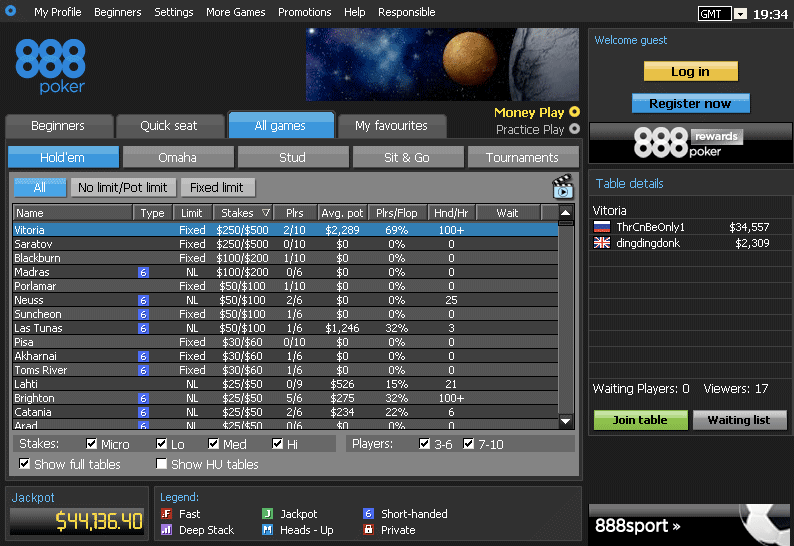 888 Poker’s tables are equipped with everything a player would want, providing a great deal of flexibility. The tables are fully resizable, though the minimum allowed table size is 500×365. All open tables can be tiled or cascaded at the push of a button. 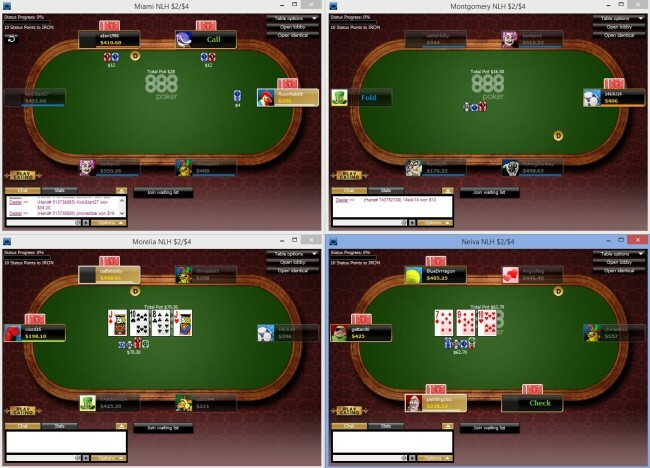 Tiling the tables allows you to view up to 9 tables at once. 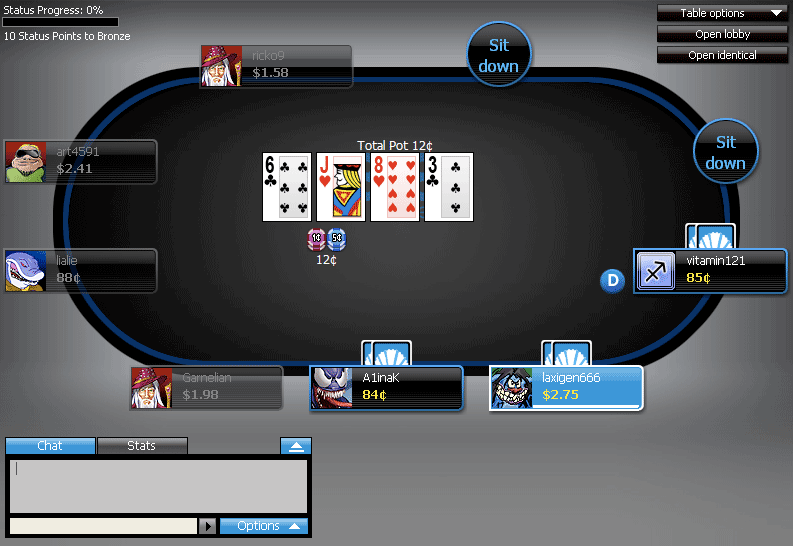 Cascading allows players to view multiple tables in a diagonal layout. 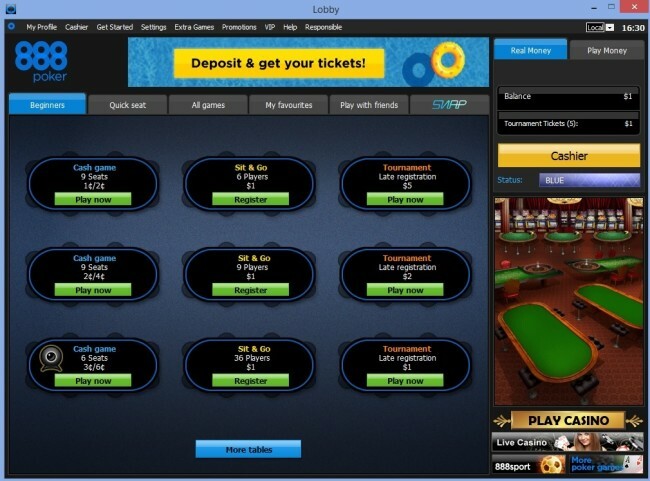 With this layout the tables are automatically adjusted to fit your screen. 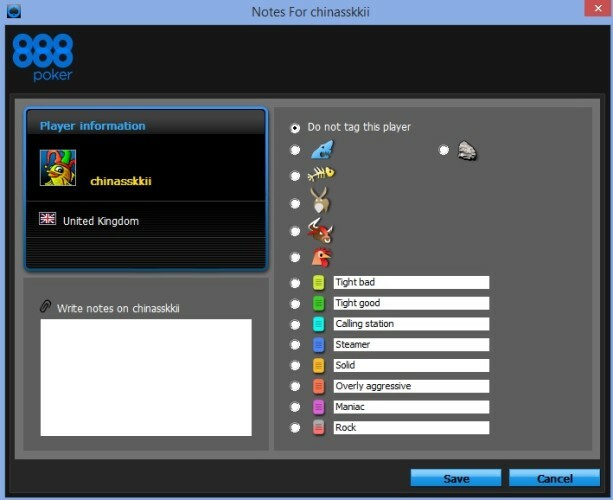 888’s sophisticated Player Notes window allows you to keep detailed notes on your opponents. Table Setting can be accessed by clicking the ‘Options’ button in the top right corner of any table. You can choose between three table themes, though one drawback is that you can’t customize individual tables, all the adjustments you make will affect all your tables. Other than that, you can adjust table graphics, sounds, animation, alerts and a whole bunch of other settings that will help you put together an even more comfortable table to play on. Since the introduction of Rush Poker by Full Tilt many years ago, Fast Poker formats are now a mainstay of any popular online poker room and 888 is no exception. ‘Snap Poker’, as it’s known here, allows you to fold your hand at any time and get deal a new one instantly, reducing waiting time between hands to virtually 0! 888 Offers Snap Cash Games as well as Snap Tournaments. 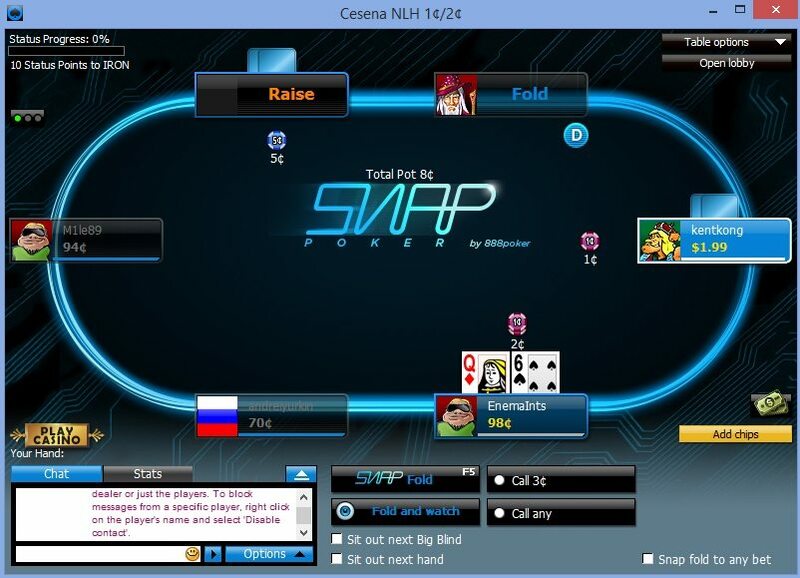 Snap Cash Games consist of player pools at different blind level and are running 24/7. Tournaments, on the other hand, have a fixed starting time, but once they get going, they are played in a fast fold format, where players are constantly shuffled around from table to table up until the final table is reached. 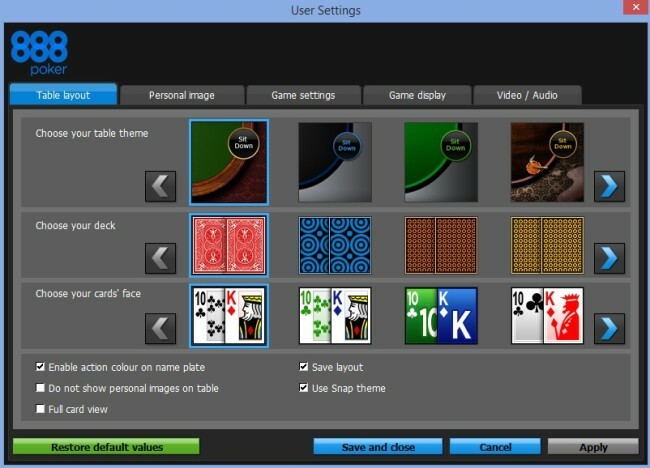 A recent addition to Snap Poker games is the ability to ‘Fold and Watch’. 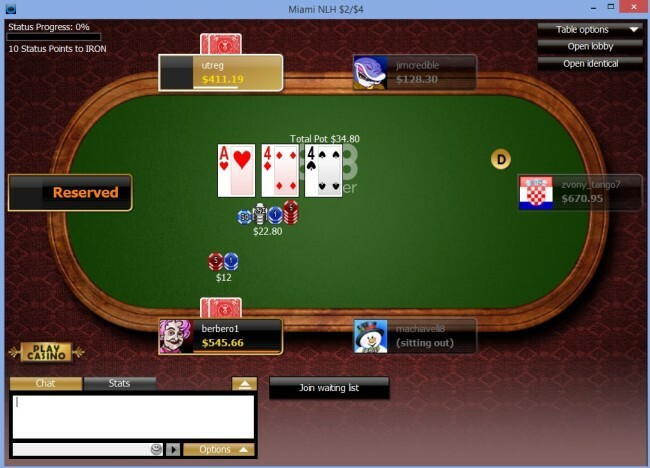 This allows players to see how the hand played out even after they have folded their hand. Snap Poker is also available on 888’s Mobile app, so be sure to check out the Mobile Snap Lobby for the fastest cash games on the go! The 888 Mobile App was introduced in 2012 and since then has been going through constant changes, improving the gaming experience along the way. The app is available for Android, iOS and Windows devices, so whatever smart phone or tablet you own, it will likely support the app. When it comes to ease of navigation and use, the 888 app is definitely on top of the game. The lobby is not cluttered at all and is extremely easy to navigate through. Choosing your favorite game and jumping in can be done in a matter of seconds. 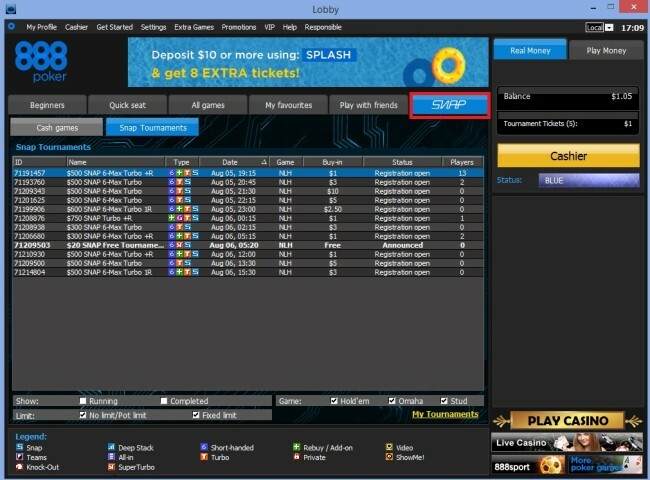 Tables are also well designed, with large components like betting buttons and sliders to reduce the possibility of miss clicks. The app does have some drawbacks though, the most striking of which is the lack of multi – tabling support. Some other limitations are also present in the mobile app, like the lack of webcam table support and some components like the Cashier are accessed externally through the mobile browser, which can be quite a nuisance if you are playing at time. All in all, the app is pretty well designed and it can be expected that drawbacks will be addressed in further upgrades, so it’s definitely worth checking it out. 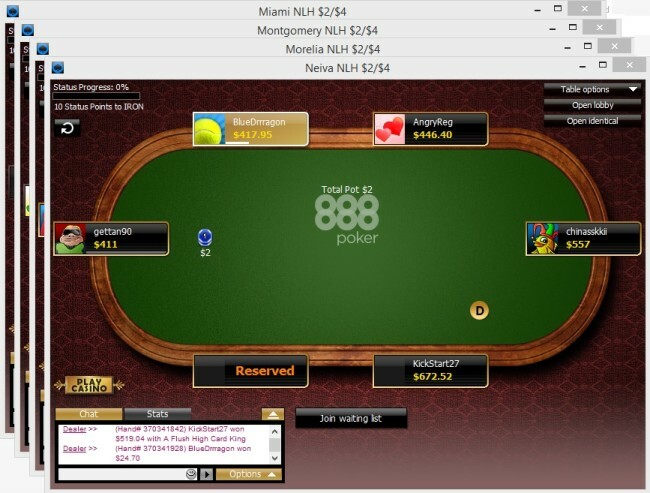 Also, check out FTR’s Full 888 poker Mobile Review. 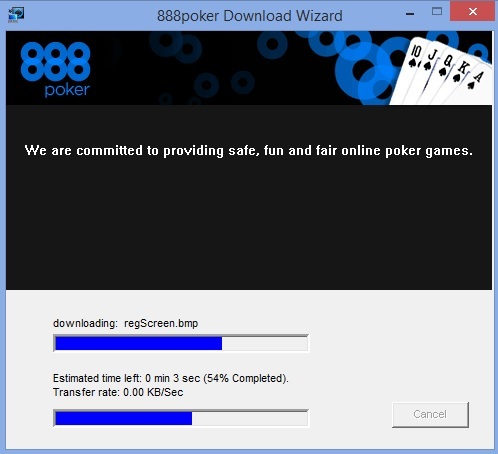 888 have put a lot of efforts into their software and even though the mobile client is still lacking in a few important areas, the overall software performance, game variety and player pool are worthy of a top tier poker room.